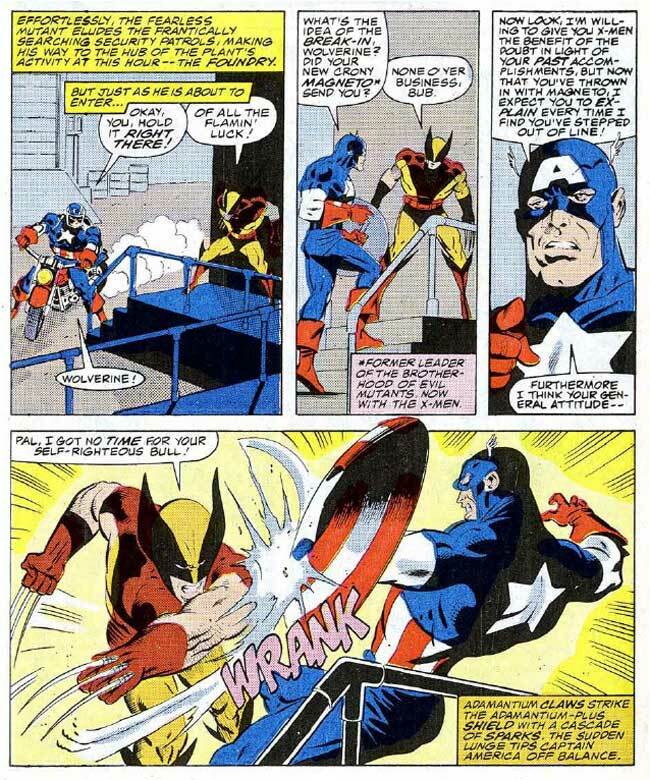 Sometimes, you meet people who just rub you the wrong way… For Captain America circa 1986, that man was the diminutive X-Man known as Wolverine. Can they set aside their differences long enough to prevent catastrophe? 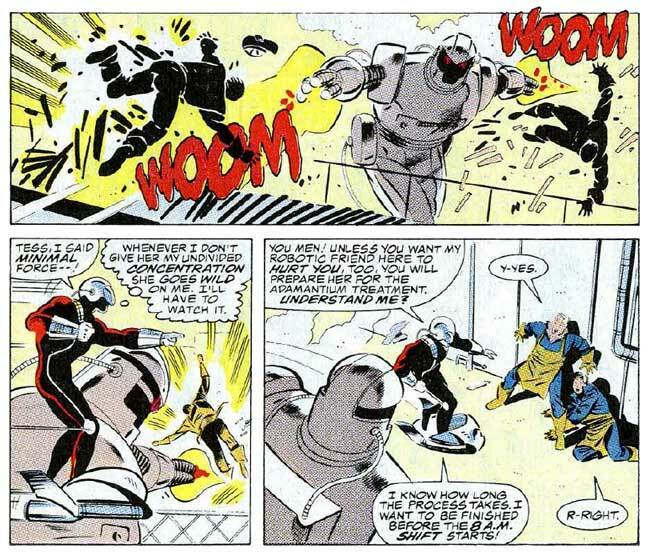 Your Major Spoilers (Retro) Review of Captain America Annual #8 awaits! 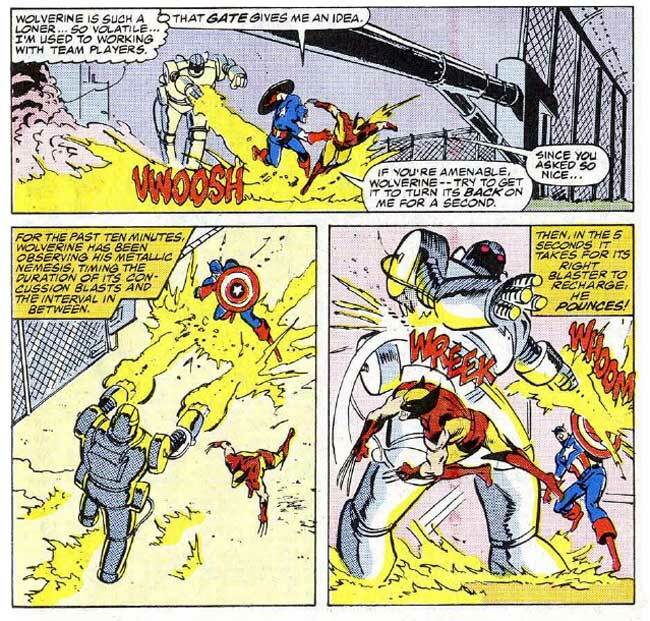 Wolverine leaps into action, slashing away at the monster to save Bob from a possibly lethal beating, but even his experience with giant flying robots that lay the smack down on mutants doesn’t prepare him for rocket boots! 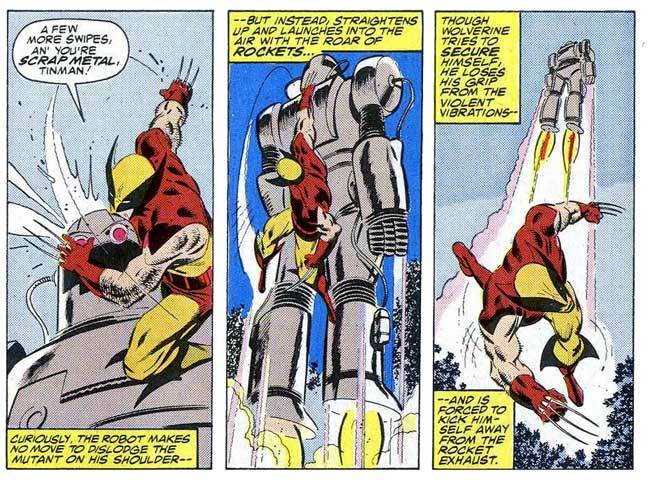 Again, since Sentinels can fly, you’d think he might have seen that one coming, but Wolverine isn’t yet the strategic genius that we expect him to be in a modern comic book appearance. 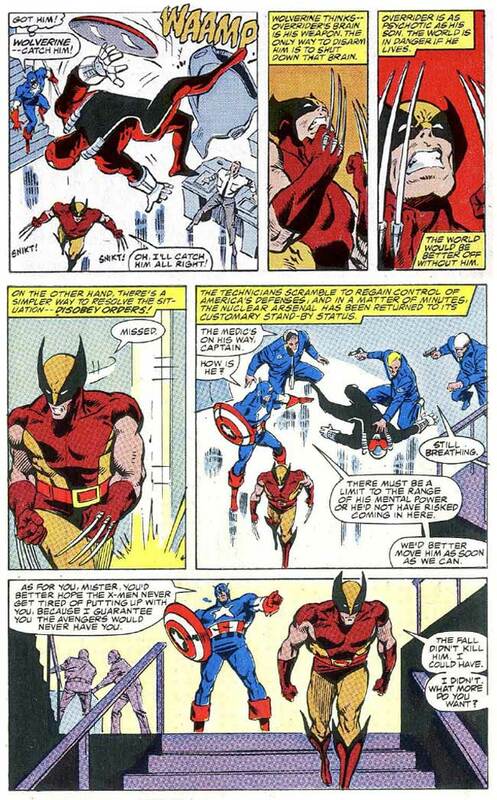 Rather than the patient, immortal soldier, this Wolverine is a headstrong, impatient jerk. 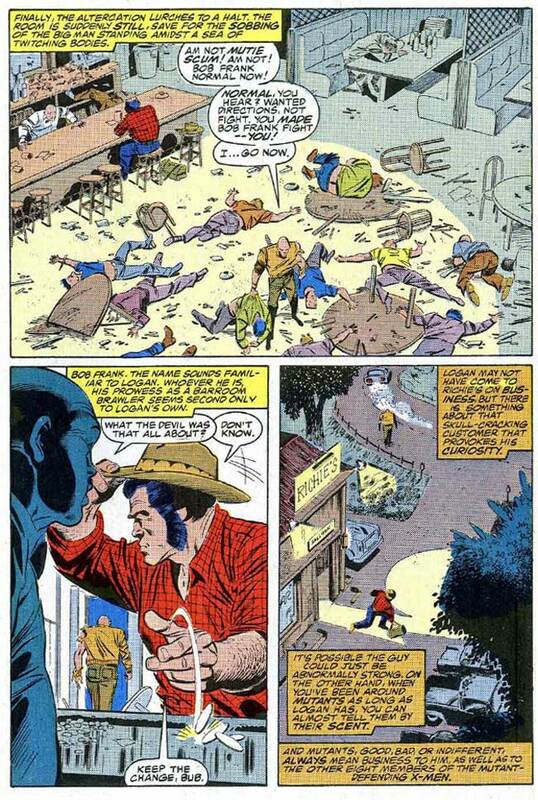 Wolverine lands safely, and rushes Bob Frank to the hospital while, not far away, the actual star of this title follows up on a mysterious sinkhole that appeared in a peculiar small town. 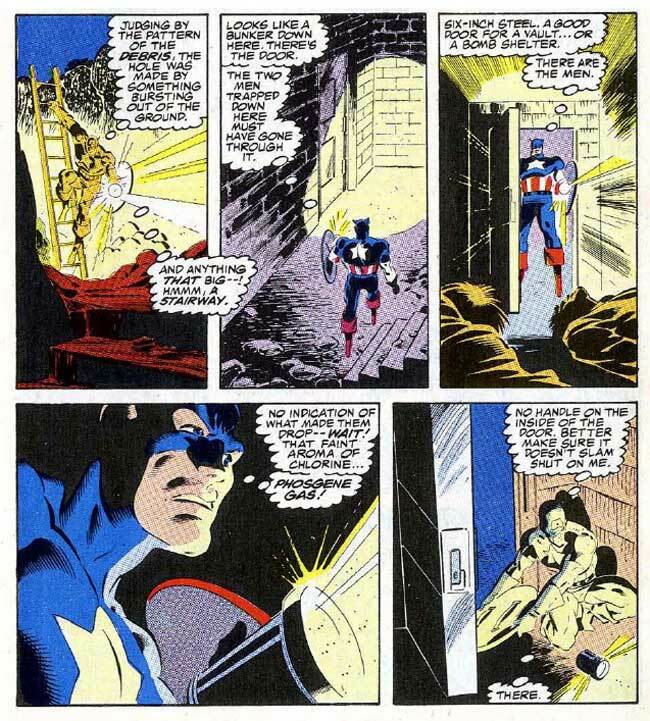 Captain America finds that this particular underground complex is more than just a bomb shelter, as it is rigged with poison gas, doors that automatically lock, and… What was it? Oh, yes! 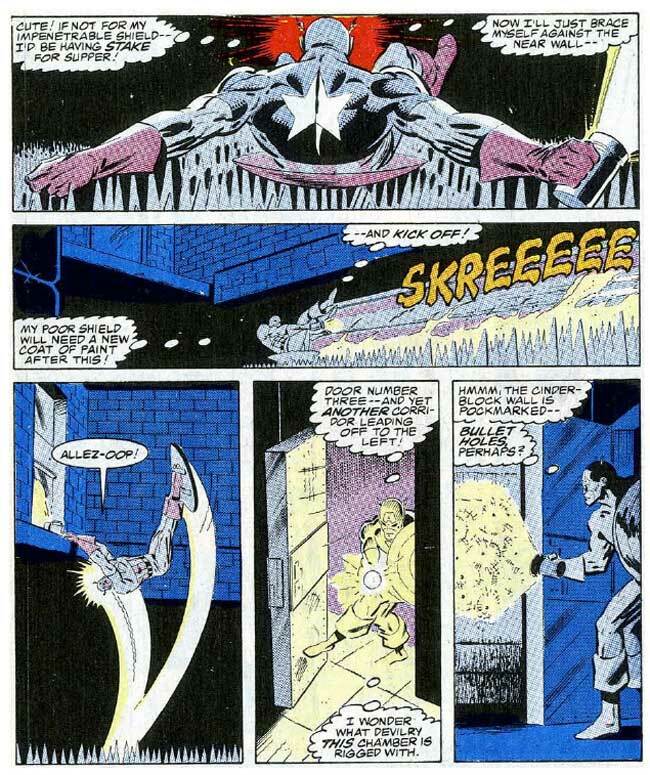 A floor that collapses into a pit of razor-sharp steel spikes for maximum deathitude! 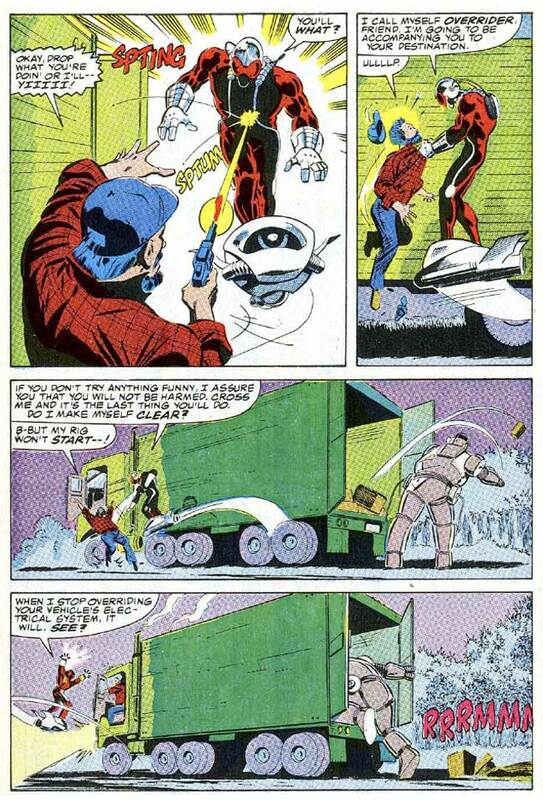 Making his way to the center of the chamber, Captain America finds evidence of the giant robot we’ve just seen, somehow kept in storage for many years. 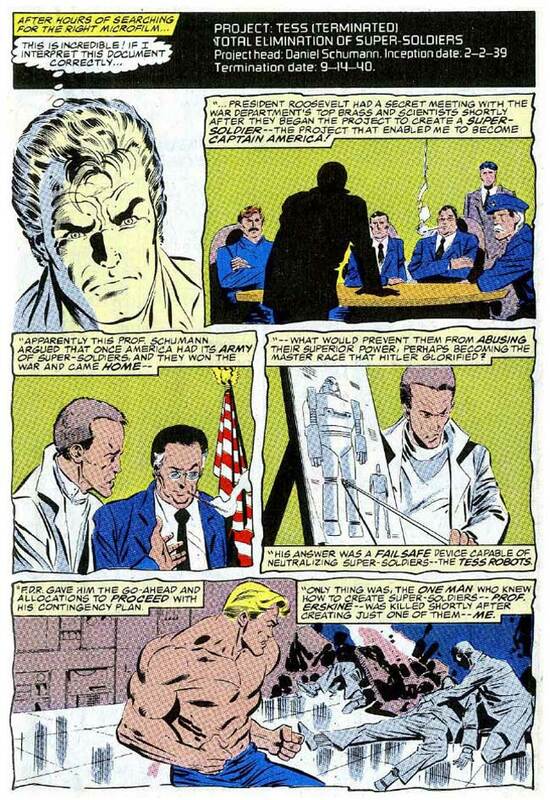 But what brought it out of storage and back into the business of violence? Glad you asked, Faithful Spoilerites! 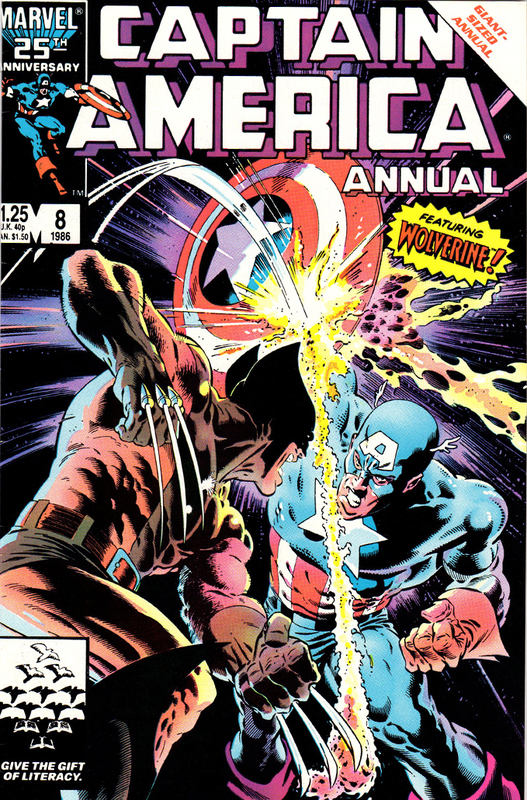 Captain America’s network of reg’lar fellers (The Stars And Stripes Network, set up to help him better find and fight crime) points him in the direction of upstate New York, where his pursuit of the robot intersects Wolverine’s score-settling. 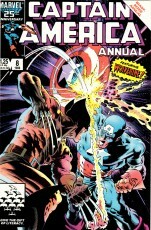 Since they’re both superheroes and it is the 1980s, their meeting is less collaboration than it is collision. Wait, what? You want to hear the rest of this story? 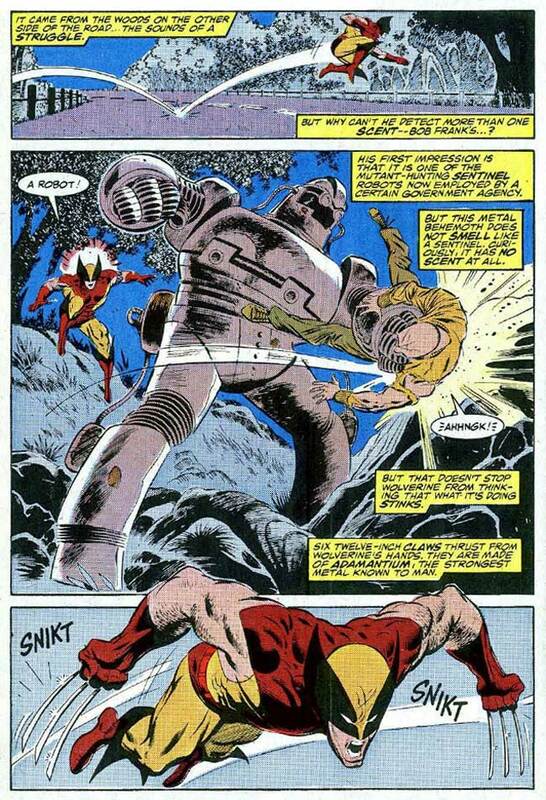 Okay, okay… Tracking Overrider and the robot to this foundry is no mere coincidence, as it is the only facility in the area that works with the indestructible alloy known as adamantium, and now the robot is coated with a layer of impenetrable metal… which is bad. 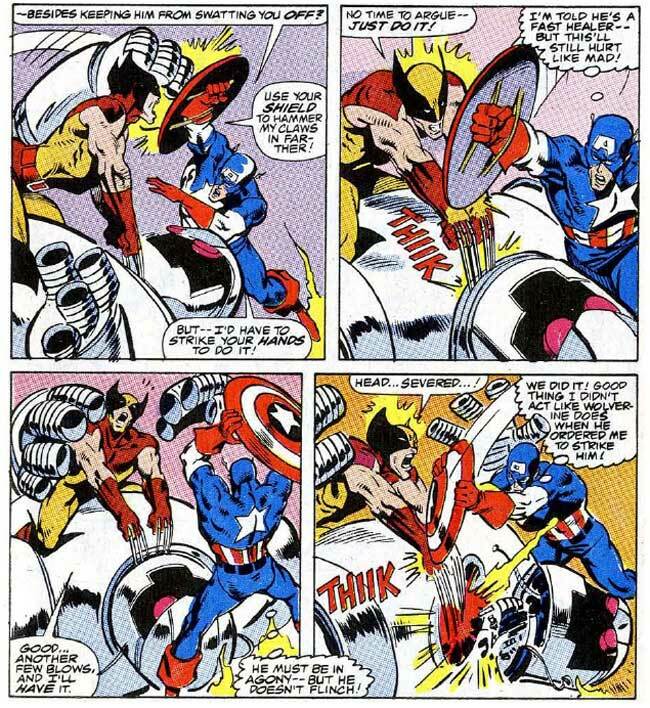 Working together (or, to be accurate, Captain America carefully working in concert with Wolverine’s uncontrollable lone wolf tendencies), the heroes bring TESS down, and realize that the weak point has to be in its joints, allowing Wolverine to take the kill shot without being stopped, for once. 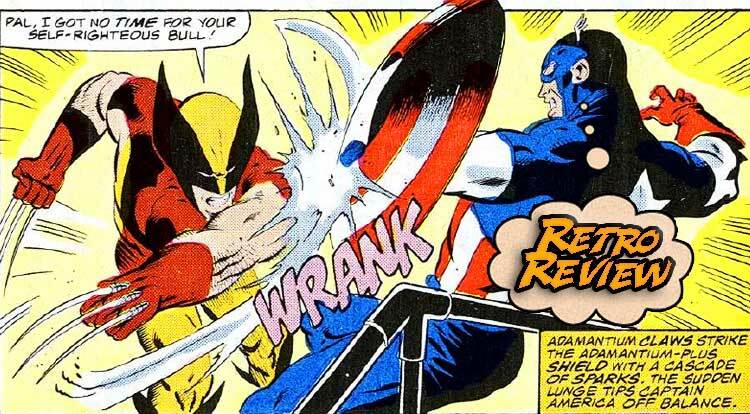 Wait, Cap’s shield vs Wolverines claws was a thing, I thought it was obvious? 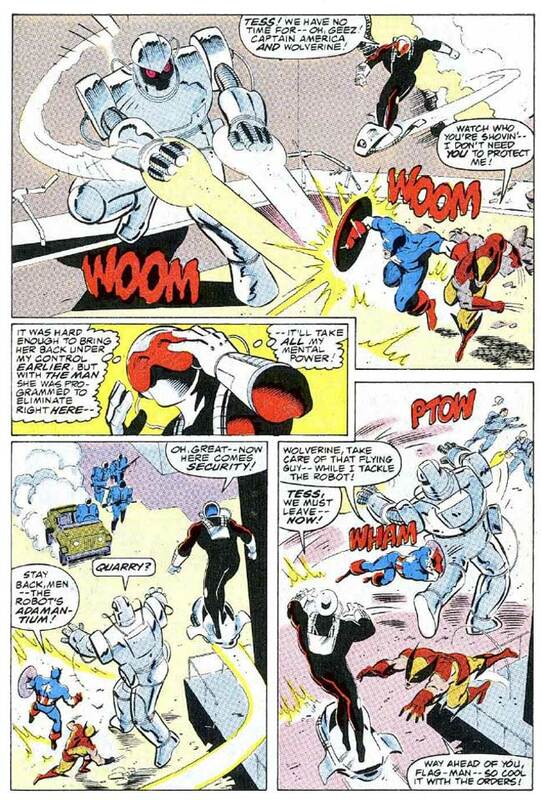 That last panel is priceless.